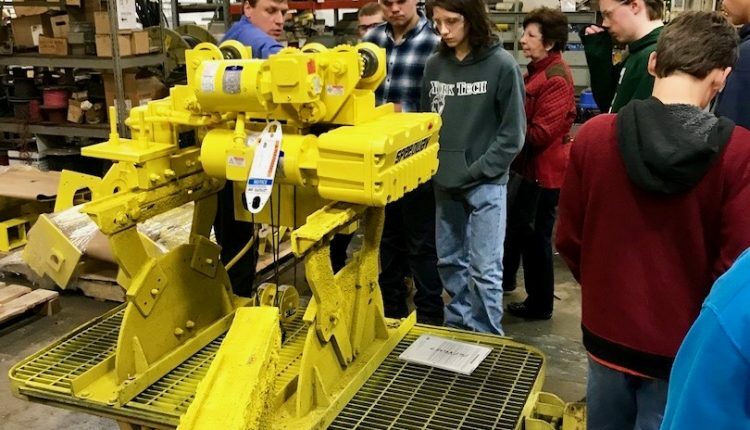 Acco Material Handling Solutions LLC, a manufacturer of material handling products, including overhead cranes and hoists, welcomed a delegation of students from nearby York County School of Technology (York Tech) to its York, Pennsylvania headquarters last month (November). The visit, instigated by Lorin Cassidy Wolfe, president and CEO at Acco, saw 22 students participate in varied manufacturing-themed activities, all under an overarching “Gemba Day” concept. As Wolfe explained, genba, also known as gemba, is a Japanese term meaning “the actual place”. Japanese detectives call a crime scene gemba, for example, and journalists might say they’re reporting from gemba. In business, gemba refers to the place where value is created; in manufacturing the gemba is the factory floor. The York Tech students, who were joined by three school administrators, are all studying computer numerical control (CNC), the automated control of machining tools. Fittingly, one of many Acco employees that they had an opportunity to engage with during the day was Patrick Gallagher, a CNC operator. A varied career recently saw him ply his trade in a Harley Davidson machine shop where he was sponsored to pursue a degree in mechanical engineering, before latterly joining Acco. Gallagher was part of the “CNC Through CEO” panel in the afternoon, which featured a welder, sales professionals, senior management, and Wolfe herself. Acco has already reached out to York Tech’s welding and engineering programs with a view to hosting a similar event in the near future.